Companies and organisations with environmental management systems certified to ISO 14001:2004 have until end 2018 to make the transition to the new 2015 version of the standard. 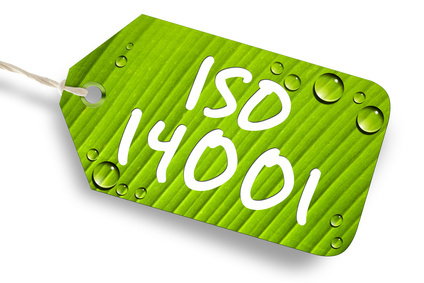 ISO 14001:2015 introduces a number of substantive changes to make the standard more effective with an overall aim of ensuring certification achieves real environmental improvements and makes a contribution to sustainable development. In this regard, it is useful to consider the roots of the standard which emerged from the environmental movement that emerged in the 1960s. However, its roots go much deeper than this and a look at these can help tease out some of the key issues and some of the philosophical concerns that underpin it. This is information an environmental or EHS officer should be aware of when conducting a strategic re-evaluation of the existing EMS and that should also be considered for the EMS, particularly in the areas of training, awareness and communications. Early environmentalism taken in its broadest sense as concern for one or more parts of the environment, including public health issues, typically involved a number of ‘movements’ which often evolved as a reaction against the horrendous conditions of industrial towns with their poor or non-existent sanitation, life-threatening levels of pollution and unsanitary slums and tenements. A search for solutions to these problems also led to a number of initiatives which are still with us in one form or another today. Modern history has also been punctuated by a series of environmental disasters or events which served to heighten public awareness and concern. The Romantic Movement arose with the German Sturm und Drang (storm and drive) movement which found its answer in England in the form of Keats, Shelley and perhaps the most popularly cited Wordsworth. Wordsworth believed that poetry should begin as “the spontaneous overflow of powerful feelings” which were often invoked by scenes of natural beauty. With something akin to a conservationist perspective he wrote of the Lake District as a “sort of national property in which every man has a right and interest who has an eye to perceive and a heart to enjoy”. One of the ‘tenets’ of the movement was a strong belief and interest in the importance of nature and the past (which was frequently viewed as a ‘golden age’). However, a ‘feeling’ for nature tended to be an individualistic concern with a focus not on nature itself but rather on the effect nature had upon the artist when surrounded by it, preferably when alone. There was also a tendency to believe that a close connection with nature was both mentally and morally healthy. The ‘Great Stink’ was an event in central London in the months of July and August 1858 during which hot weather greatly exacerbated the smell of untreated human waste and industrial effluent flowing into the River Thames. The problem had been mounting for some years as the result of an ageing and inadequate sewer system that emptied directly into the Thames while infected water supplies had resulted in several cholera epidemics that had killed thousands of Londoners. Large numbers of labourers were paid to spread chalk lime, chloride of lime and carbolic acid on the waterway and riverbanks to control the smell and by June of 1858, the stench from the river had become so bad that business in Parliament was affected and curtains on the river side of the building were soaked in lime chloride to try and ease the stench. The measure did not work and discussions were held about possibly moving the business of government to Oxford or St Albans. The Metropolis Local Management Amendment Bill was passed into law in record time on 2 August of that year initiating the construction of a modern sewerage system which still serves London to this day. For most of the century from 1850 to 1950 the primary environmental cause was the mitigation of air pollution. The Coal Smoke Abatement Society was formed in 1898 founded by artist Sir William Blake Richmond whose involvement arose from frustration with the pall cast by coal smoke in winter! In an 1898 letter to the Times calling for action he wrote that, “the darkness was comparable to a total eclipse of the sun”. One of the early and largely ineffective provisions of the Public Health Act 1875 required all furnaces and fireplaces to consume their own smoke and this was extended in 1926 with the Smoke Abatement Act to include other emissions, such as soot, ash and gritty particles. 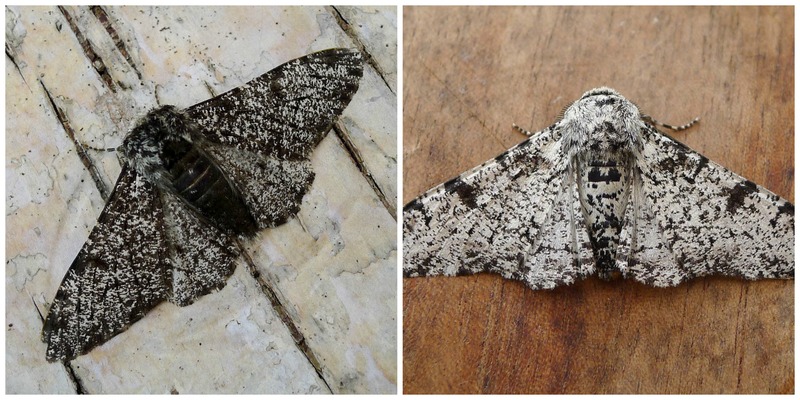 The peppered moth (Biston betularia) is a night-flying moth with colouration suited to provide it with camouflage during the daytime as it rests on lichen-encrusted tree trunks. It exists in two forms or morphs, one with cryptic colouration (B. betularia morpha typica) that makes it almost invisible on ‘clean’ tree trunks and another black or melanistic form (B. betularia morpha carbonaria) that typically forms 5% of the population and is usually quickly predated by birds due to its high visibility. However, the coal-generated air pollution had the effect of coating all in black soot particles and transformed previously multi-coloured, lichen-covered trees into blackened trunks. This reversed the odds for the two forms and bird predation quickly resulted in the black form making up 95% of the population in a striking and popularly used example of natural selection. Once air quality improved after the Second World War, light-coloured peppered moths become the common form again. Another branch of the early ‘environmental’ movement, the Commons Preservation Society was founded in 1865 and was concerned with preserving open spaces for the poor and increasing access to the countryside for the general population which was threatened by enclosure of the historical rights-of-way network through England and Wales. Its founders and early members included the philosopher John Stuart Mill, Lord Eversley, William Morris, Sir Robert Hunter, and Octavia Hill. Hunter was later involved in the founding of the “National Trust for Places of Historic Interest or Natural Beauty” (aka the National Trust) in 1893 which obtained secure footing through the 1907 National Trust Bill which gave the trust the status of a statutory corporation. An early “Back-to-Nature” movement was advocated by intellectuals such as John Ruskin, William Morris, Irish playwright (and early vegetarian) George Bernard Shaw and Edward Carpenter, who were all against consumerism, pollution and other activities harmful to the natural world. Hand in hand with the political aspects of the movement was the emphasis on the traditions of a distant and reputedly happier past which among other things led to the revival of Morris dancing, May queens, maypoles and folk singing. From 1872 to 1903 Zoologist Alfred Newton published a series of investigations into the Desirability of establishing a ‘Close-time’ for the preservation of indigenous animals and advocated for legislation to protect animals from hunting during the mating season. 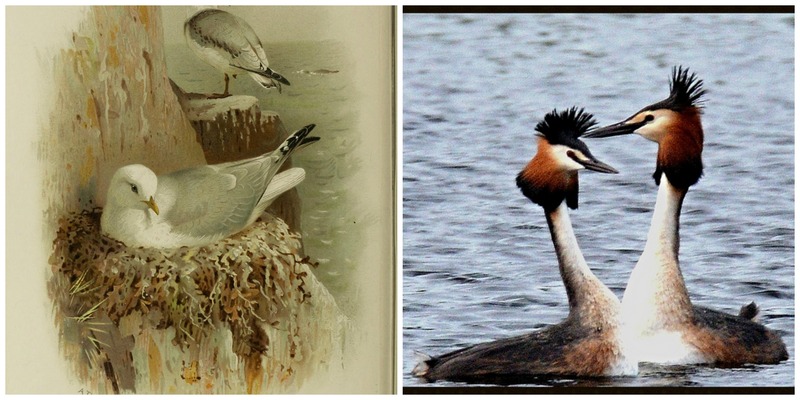 This led to the formation of the Plumage League in 1889 (later the Royal Society for the Protection of Birds, now the largest wildlife conservation charity in Europe) which initially acted as a protest group campaigning against the use of great crested grebe and kittiwake skins and feathers in fur clothing. A Garden City movement was initiated in 1898 by Sir Ebenezer Howard in the United Kingdom which aimed to combine the town and country in order to provide the working class an alternative to working on farms or ‘crowded, unhealthy cities’. Garden cities were intended to be planned, self-contained communities surrounded by “greenbelts” with proportionate areas of residences, industry, and agriculture. The first was built in 1904 at Letchworth outside of London followed by another at Welwyn. These remained the only examples however, but the movement did succeed in promoting the need for better urban planning policies and was taken up again particularly in the aftermath of World War II both in England and internationally. Across the pond, in the late nineteenth century Thoreau was interested in peoples’ relationship with nature and studied this by living close to nature in a simple life detailing his experiences in his best known book Walden; or, Life in the Woods. Pioneers of the early conservation movement called for more efficient and professional management of natural resources as they believed the destruction of forests, fertile soil, minerals, wildlife and water resources would lead to the downfall of American society. An early success was characterised by the use of photography which was used to demonstrate the grandeur of the Yellowstone region resulting in the creation of the world’s first national park at Yellowstone in 1872. In 1891, Congress passed the Forest Reserve Act, which allowed the President of the United States to set aside forest lands on public domain. Somewhat in contrast, a preservationist approach was promoted by John Muir, a Scottish-American naturalist (‘John of the mountains’) and “patron saint of the American wilderness“. Muir’s writings exalted the aesthetic and spiritual aspects promoting the belief that all life was sacred in terms inspired by his strict religious upbringing and rote knowledge of the Bible. He also promoted the need to get out and experience nature once writing that “no amount of word-making will ever make a single soul to ‘know’ these mountains.” As a preservationist, Muir envisioned the maintenance of pristine wilderness where any development was banned and his activism (which included a night camping in the backwoods of Yosemite with President Roosevelt) helped to preserve the Yosemite Valley, Sequoia National Park and other wilderness areas. He also co-founded the Sierra Club, America’s oldest conservation movement in 1892. A number of events also influenced the thinking of the conservation movement. The most notable of these related to the passenger pigeon (Ectopistes migratorius), a species of pigeon that was endemic to North America. This bird migrated in enormous flocks and at one point is thought to have constituted 25 to 40% of the total bird population of North America, numbering around 3 to 5 billion at its peak. To give an example of its abundance, one flock in 1866 in southern Ontario was described as being 1.5 km wide and 500 km long, took 14 hours to pass, and held more than 3.5 billion birds. The largest nesting area ever recorded was in central Wisconsin in 1871 and was reported as covering 2,200 square km (850 square miles), with the number of birds nesting there estimated to be around 136,000,000. They could be shot with such ease that many did not consider them to be a game bird, as an amateur hunter could easily bring down six with one shotgun blast and a particularly good shot with both barrels of a shotgun at a roost could kill over 60 birds. 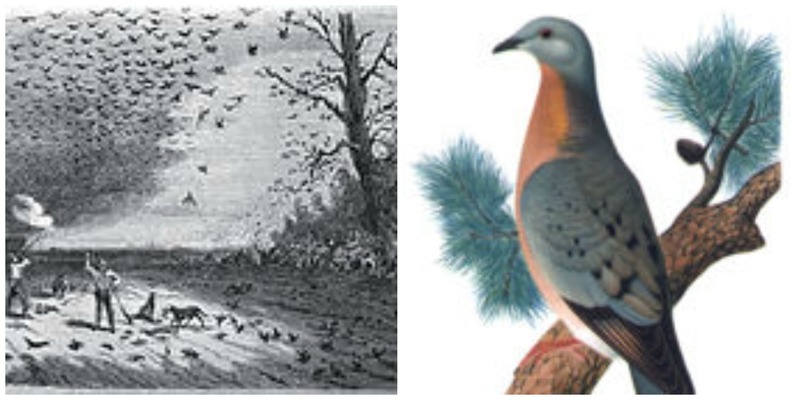 Main reasons for the extinction of the passenger pigeon were the massive scale of hunting to provide meat and eggs, the rapid loss of their habitat, and the extremely social lifestyle of the bird, which made it highly vulnerable to these factors. Thus, in the space of less than fifty years it went from being perhaps the most abundant bird on the planet to extinction when ‘Martha’ the last passenger pigeon died on 1 September 1914 at Cincinnati Zoo. The destruction of this species provided a seminal example of our unprecedented ability to destroy even the most abundant of creatures. 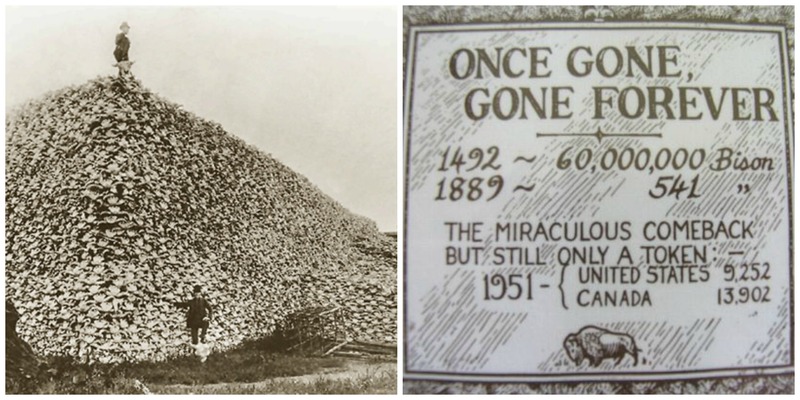 This sobering fact was also highlighted by the plight of the American buffalo or bison. Bison probably numbered from 30 to 60 million at their peak and were the most numerous single species of large wild mammal on Earth. 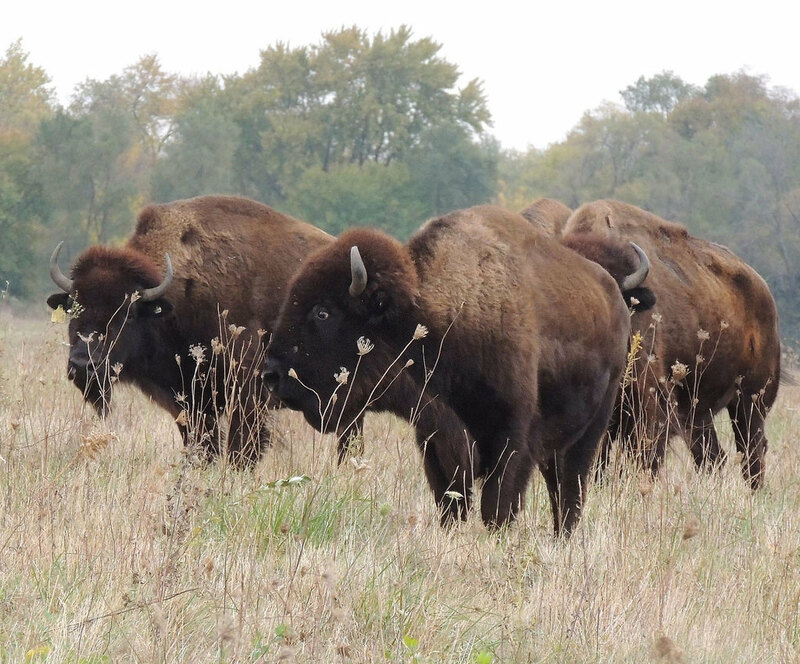 Historically, the American bison played an essential role in shaping the ecology of the Great Plains. They graze heavily on native grasses and disturb the soil with their hooves, allowing many plant and animal species to flourish. Prairie dogs prefer areas grazed by bison where the grass is short so they can keep a lookout for hungry predators and their burrows in turn provide homes for many other prairie species. Wolves also relied on bison herds as a major food source. The great plains were described by early explorers as “one black robe” and the “plains were black and appeared as if in motion” due to the herds of bison. One train on the Kansas Pacific Railroad in 1868 travelled 120 miles through one continuous herd while another train in Kansas was stopped in its tracks for eight hours while one unending herd of buffalo passed by. Destruction of the prairies for farmland, industrial-scale hunting for the tongue (which was a delicacy), robes and meat and development of a new tanning process which enabled the processing of their hides for leather led to their disappearance across large tracts of their range. For a time bison hunting became a favourite sport of the wealthy and train companies offered tourists the chance to shoot buffalo from the windows of their coaches, pausing only when they ran out of ammunition or the gun barrels became too hot. An estimated two million bison were killed on the southern plains in 1870 while one railway engineer said it was possible to walk 100 miles along the Santa Fe railroad right-of-way by stepping from one bison carcass to another. Finally a policy of extermination as a weapon of war to break the Plains Indians by depriving them of their main food source drove numbers down to a low point of several hundred animals by the 1890s. An American general commented that buffalo hunters “did more to defeat the Indian nations in a few years than soldiers did in 50” and this same prejudice scuppered many of the early attempts at conservation. Eventually however, the unprecedented slaughter and concern for its continued existence gave rise to one of the earliest effort in species conservation as the American Bison Society was formed in 1905 with Theodore Roosevelt as its honorary president. Today there are some 30,000 bison in conservation herds but as this is still a fraction of the original number it is still classified as Near Threatened. In recognition of this and its symbolism in US history, last week the bison became the first national mammal of the US putting it alongside the bald eagle. The passenger pigeon of course, won’t be making a comeback.